The Partiologist: Cookies and More Cookies! It's a busy and glamorous life being The Partiologist. Well, maybe not always glamorous (although I do put makeup on at least once a week) the rest of the time I hide when the doorbell rings. 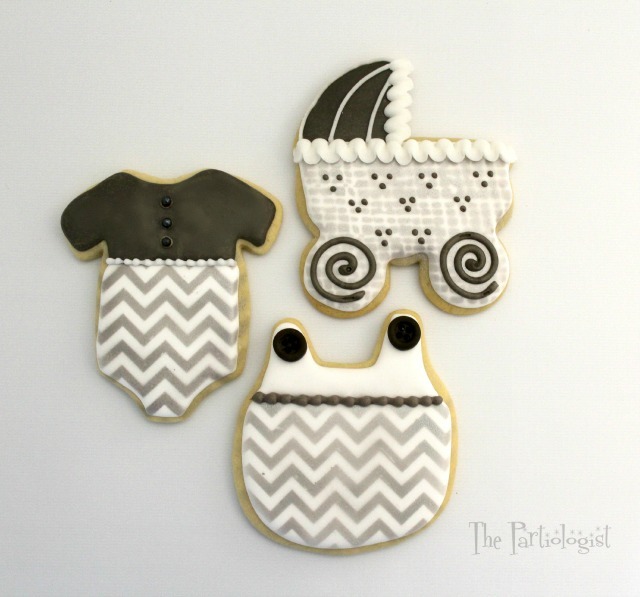 Here's why, you may already know I also make cookies and lately cookies have been taking up much of my time, so I thought I would share what I'm up to behind the blog. 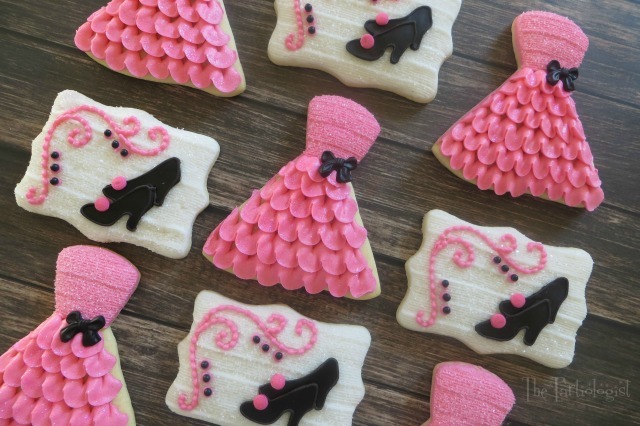 Most of the cookies are the designs from orders of three to six dozen, that's a lot of cookies people. 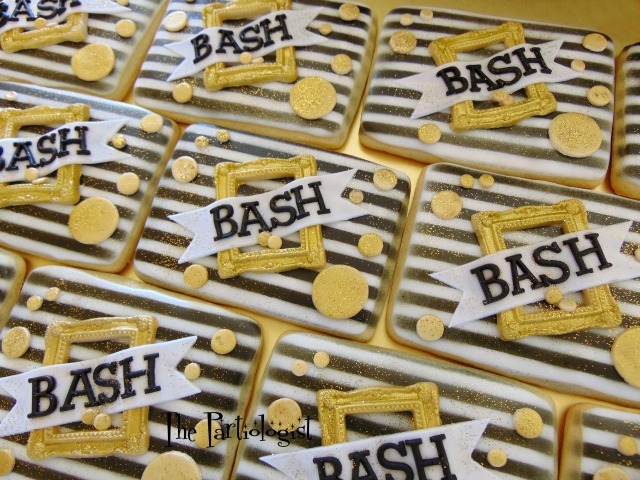 I love working with royal icing and I'm trying to convince my family and customers to enjoy a crunchy cookie. Sometimes they let me go with royal and a lot of the time I get a firm, no royal, I want buttercream. Since I aim to please, here's a set of cookies for a 30th birthday, all in buttercream. 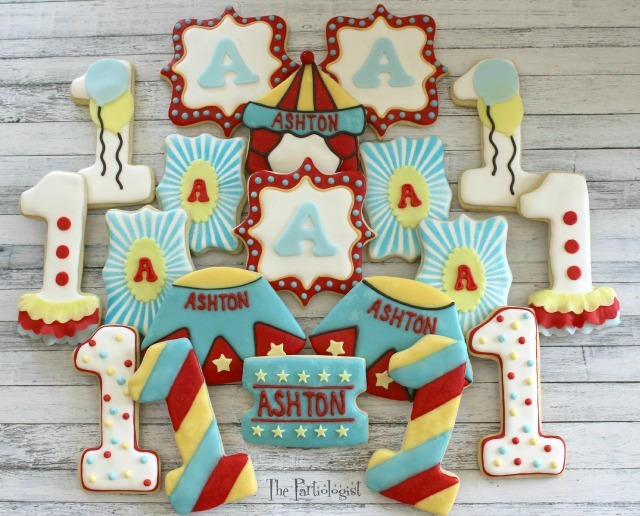 Next is a set of circus cookies for a 1st birthday. I worried about the blue being the wrong color of blue and couldn't sleep. The first thing said when she picked them up was, the blue is perfect, it matches everything. WHEW! 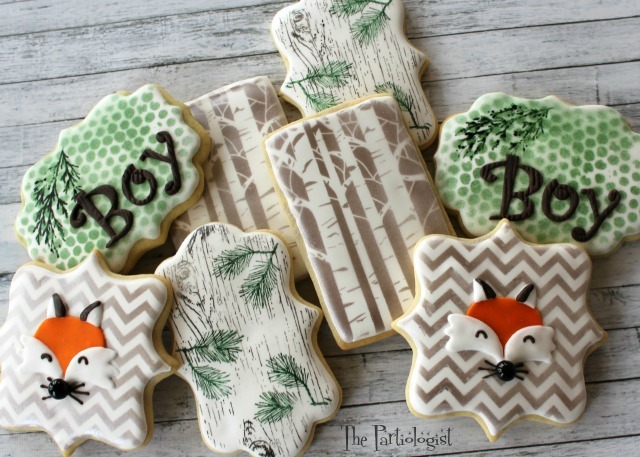 After an order of cookies for a woodland themed baby shower came in, I couldn't wait to get started. Here are a few from the six dozen ordered. 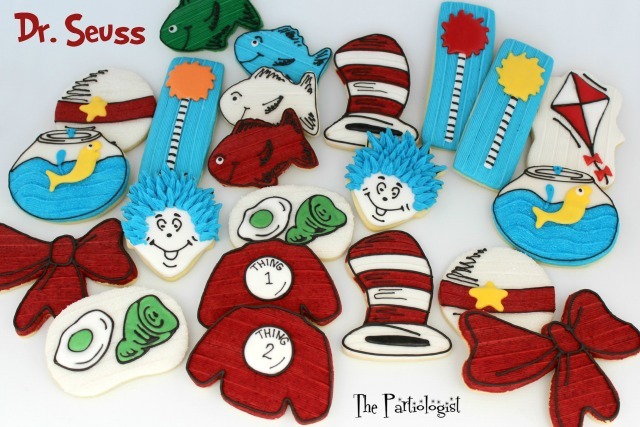 One of my favorite sets to create were the cookies for a cast party of "Seussical The Musical". These are from the set of six dozen cookies, frosted in buttercream. Then came the order for three dozen tool themed cookies for a celebration of a hospital building project being completed. 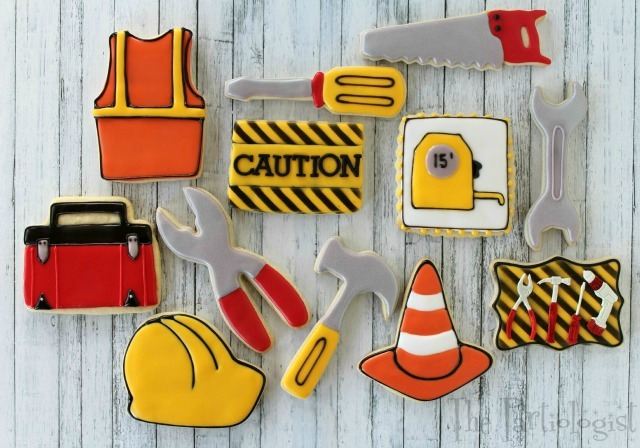 While I had the tool cookie cutters on hand, I had to make the vest, tool box, hard hat and cone cutter. 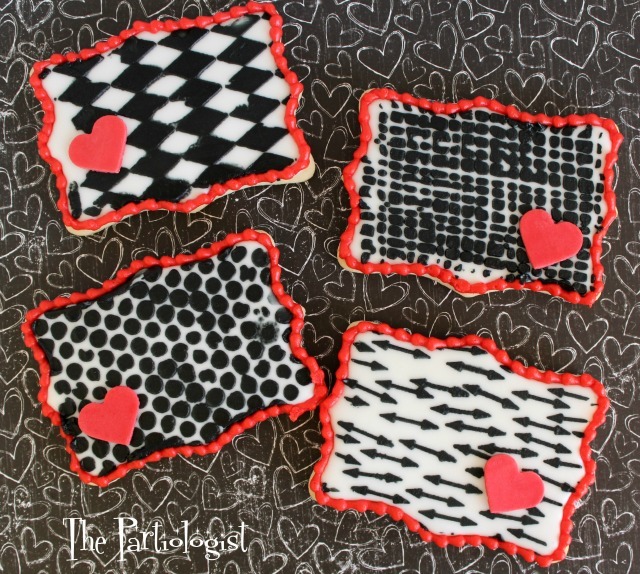 And a few extra Valentine cookies for fun and because I wanted to try my new stencils! 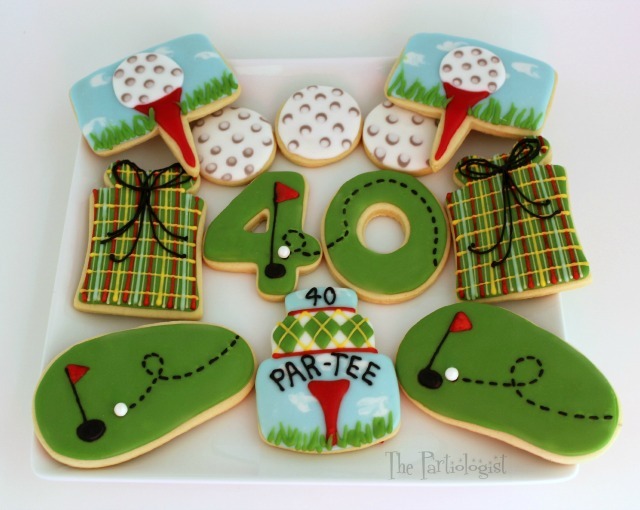 Heading to Arizona for a weekend of golf, his wife ordered cookies to help celebrate his 40th Birthday! Speaking of Arizona, here were the cookies I created for my table at the BASH conference. So there you have it, here's what I'm up to when I not planning a party or making something special for the blog. Oh wait, that's not true, I make cookies ALL the time. These are just the ones I had time to photograph before they went out the door! Thanks for taking a look...Keep Calm and Cookie On! You are so AMAZINGLY talented and generous. To make such nice assortments of cookies for each customer is incredible. Each design is so detailed and fits perfectly with the theme. Your customers are very lucky to have you in their area. Wow - you've been busy! 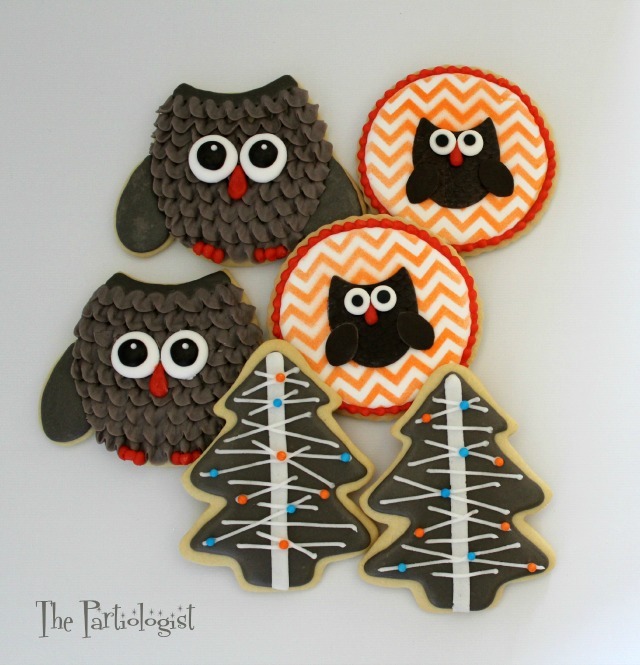 Great cookies! Oh my!!! I was going to pick my favorite...but...they are ALL so wonderful that I can't just pick one! You are beyond talented!!! Aww, you're so sweet, thank you. Yep, she wanted buttercream, so that's what she got - Thanks Karen! That's so sweet, I do love making new designs!